Council approved the Richland County Comprehensive Plan on December 15, 2009. The plan serves as the official statement of the county’s growth management policy and recommendations intended to guide growth & development over the next 20 years. The Comprehensive Plan is organized into nine Elements. They are Population, Housing, Cultural Resources, Natural Resources, Economic Development, Transportation, Priority Investment, Community Facilities, and Land Use. Each Element includes an inventory of existing County conditions, a statement of needs and goals, as well as implementation strategies to achieve these goals. The overall goals of the Plan evaluate population growth and changes, identifying where people live and work, in addition to identifying and protecting the County’s natural and cultural resources. Furthermore, the Comp Plan addresses issues of land use in an effort to accommodate changes to the population, housing, and economy. 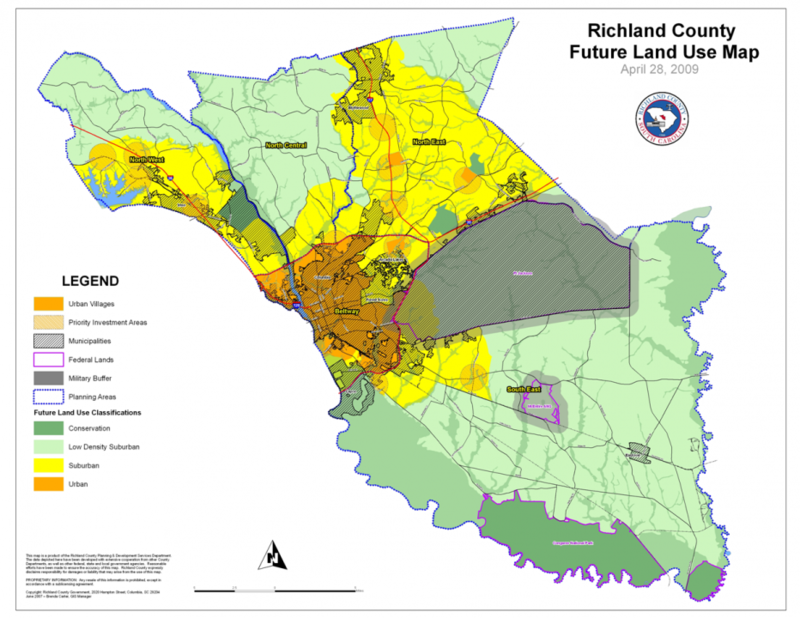 Richland County’s Development Services staff utilizes the Comprehensive Plan Future Land Use Map, a part of the Land Use Element of the 2009 Comprehensive Plan, and the other elements as growth management recommendations and planning tools that support daily functions. Guidelines set by the Constitution, federal law and case law includes statutes to ensure that the redistricting process and the plans that result from that process are in compliance. Once the process is complete, some states must send a documented version to the Justice Department for review and preclearance. The 2010 Census data provided detailed demographic information collected and aggregated to a number of geographical levels. Planning GIS received this data also known as P.L.94-171 data on March 23rd, 2011. Census data is compiled in blocks, the smallest defined area where persons live, followed by Block groups, the next largest defined area; still larger are Tracts, and Counties and States. Blocks also compile Voter Tabulation Districts or Voting Precincts, which in turn define counties that define states. Planning GIS used the ARGIS Redistricting Extension to create the new council boundaries. During the process, the county held public meetings to receive citizen input and held workshops with council members and staff. Richland County received it’s preclearance 12/2/2011. Zoning is defined as the public regulation of the use of land. It involves the adoption of ordinances that divide a community into various districts or zones. Each parcel is located in a zoning district primarily dedicated to agricultural, residential, commercial or industrial use. On March 1, 2005, the Richland County Council approved the first 10 priority focal areas for Neighborhood Master Planning and from those designated locals Planning GIS created a layer called Master Planning Areas. A neighborhood master plan is a detailed study of the specific planning issues related to a residential neighborhood and its commercial component. Each neighborhood master plan is unique, but many contain similar elements demographics, current and future land use for residential, commercial, open space, civic and recreational uses. Capital improvements that affect safety, housing, economic development, community access and public services are also similar. The Land Development section of the County Planning Department reviews all applications for land development, subdivision, and planned development approvals for compliance with the County Land Development Code (Chapter 26).